This is my new favorite thing to make and eat. So healthy, so delicious, and yes, really easy to make. 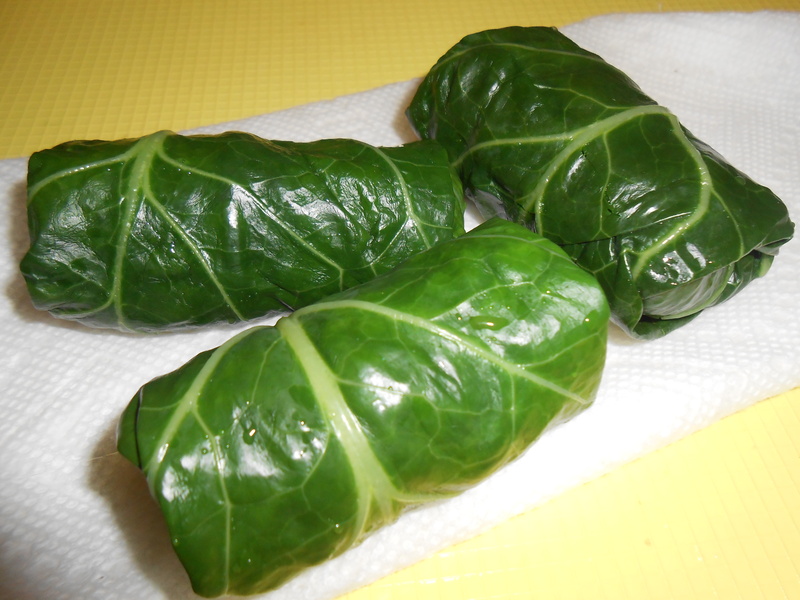 For my New Years dinner I bought a ton of fresh collards to cook, but saved about five large leaves to make the wraps. I made up a mixture of quinoa (a species of grain grown primarily for its edible seeds), roasted vegetables, and folks, the key here is “flavor”, a little soy sauce, splash or so of Worcestershire, and of course-my favorite ingredient-cayenne pepper. So you might want a dash of hot sauce, chili peppers or what ever spice you crave. I have been buying jalapenos and dicing them up and freezing to add to everything, especially omelets. *Wash your hands thoroughly after handling as I have had some annoying irriitations on my face. 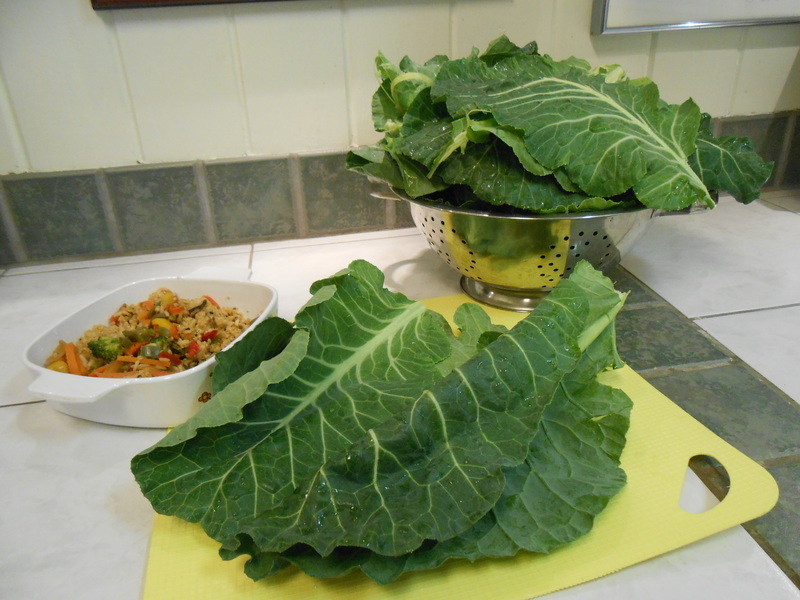 Turn those beautiful collard green leaves on their back and carefully trim the spine with a sharp knife-careful not to cut through the leaf or your finger. Have grain and veggie mix ready. To a pot of boiling water add 1 leaf for about a minute or less, then immediately add the leaf to a bath of ice water-lay out on board or counter on top of paper towel. This leaf is now so relaxed and willing for you to fill it with your wonderful mixture. Spoon a layer of filling across (tablespoon or so) the leaf and fold over tightly holding all together, then fold up the sides and begin to roll up like a burrito. (Practice makes perfect!) Slice in half for a great little appetizer or snack, to be dipped in what ever you choose-many dipping sauces can be purchased on the International aisle of your grocery store. 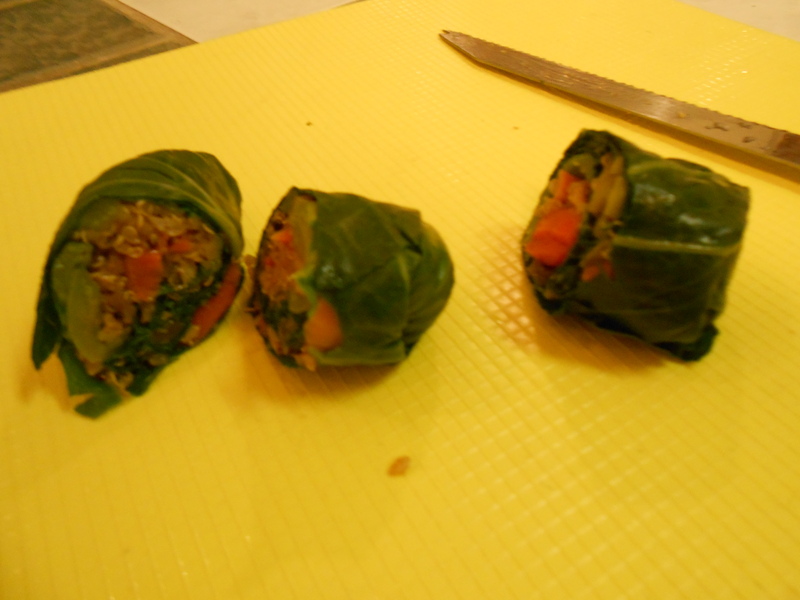 Great for a picnic as they do not break down and can be kept in refrigerator over night. Hey! What about those brown bag lunches? You can use any grains or fillings for yours. Be creative. Go for it !